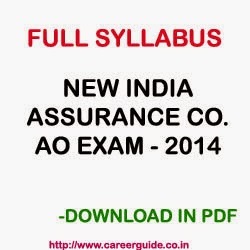 The New Indian Assurance Company Ltd (NIACL) the biggest general assurance company fully owned by Govt of India has opened 509 vacancies of Administrative Officers (AO) through recruitment notification 2014. Click here for detailed notification and link to apply online. To start preparation to crack the AO written online exam candidates must know the exam pattern and full syllabus. This will help them to make study time table giving genuine time to each topic to better your chances of success. The exam will be fully objective type with multiple choice questions (MCQs). The mode of exam will be through Online test only. The question paper will be for total 200 marks. The duration of exam will be Two Hours (120 minutes). There will be negative marks for wrong answers. 1/4 of the marks allotted will be deducted as penalty for wrong answers. Question paper will be both in Hindi as well as in English except for English Language test. Candidates clearing minimum cutoff score (as decided by examination authority) will be called for Interview. Previous Year Papers of NICL Assistant Exam.